The main laboratory floor at Element’s Warwick facility is a long rectangular strip of environmental chambers, test cells and machines. There are a lot of machines: for heating things up, cooling things down, shaking things, driving sand at things and dropping things. There are instruments for measuring and recording, data acquisition systems and computers for analyzing data. Interspersed are the things being tested, sometimes sitting atop complex metal fixtures. Employees are busy, consulting test plans, making adjustments to tests or looking at graphs on screens. The Warwick laboratory covers 42,000 square feet (4,000 square metres) and is the largest independent UKAS (United Kingdom Accreditation Service) accredited environmental test facility in the UK. It employs 45 full-time engineers and technicians. 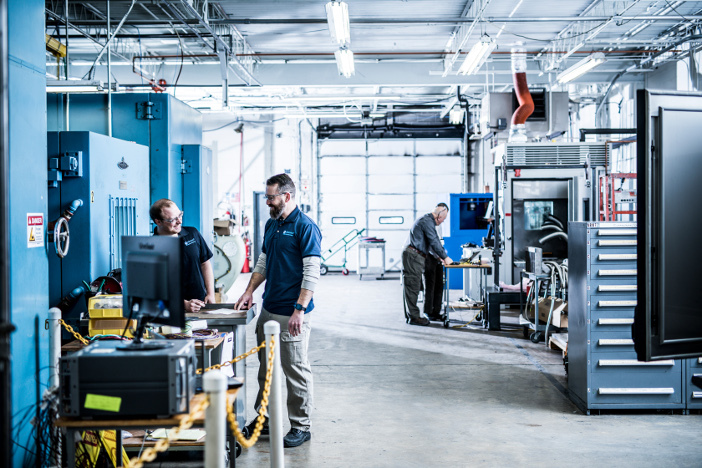 Around 75% of the testing performed at the laboratory is for the aerospace sector, for clients ranging from large OEMs such as Airbus, Rolls-Royce and UTC Aerospace, to Tier 3 component suppliers in the commercial and defense sectors. The products being tested vary from large structural elements of aircraft down to small electronic components such as microchips and circuit boards. “It’s mainly products for future deployment. Customers come to us before manufacturing for development and qualification testing,” says Stuart Brown, general manager of the laboratory. However, Element Warwick isn’t just about physical testing. On the floor above the laboratory is a team of engineers designing in CAD and running FEA simulations. This Early Stage Qualification (ESQ) team helps clients with test procedures and designs the fixtures that hold objects under test while being subjected to shock and vibration. This is key, because a poorly designed fixture could adversely affect test results or cause damage. “We run the simulations to ensure we’re not creating unwanted resonances,” says Brown. At first the laboratory floor, with its bustle and various activities, seems chaotic – but slowly the organization reveals itself. Dominating the center are eight vibration test cells that house the largest and most valued pieces of test equipment. 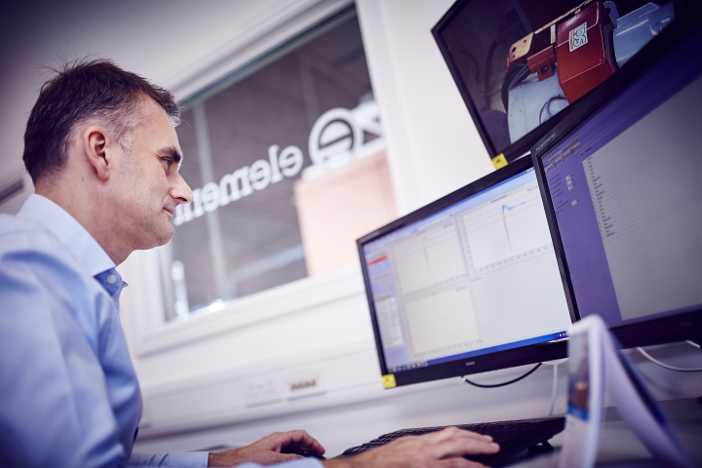 Closest to the office area and ESQ team is a section for bespoke testing, where hydraulic, pneumatic and fatigue testing is conducted. A common sight here are items such as fuel pumps, which are fatigue tested using cyclical and differential pressure testing. Next to the bespoke testing area on one side of the laboratory are 20 environmental chambers of various sizes and types. These can recreate temperatures as low as -73°C (-99°F) and as high as +500°C (932°F) and various humidity levels at altitudes of up to 90,000ft (27,000m). 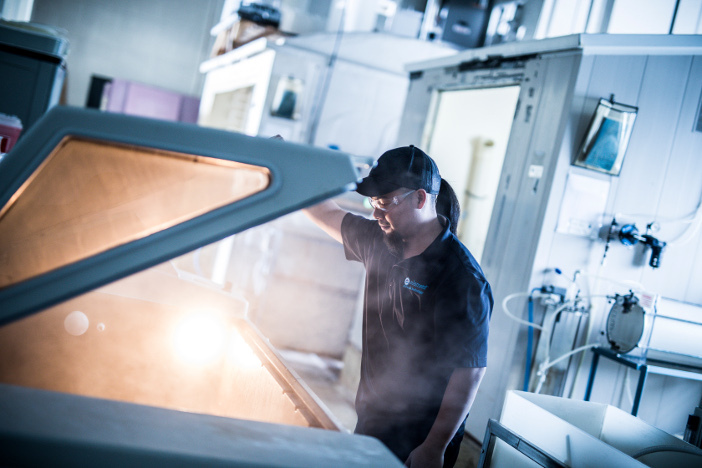 There is a corrosion testing chamber, where entire products can be tested for up to and beyond 10 weeks and a driving sand and dust chamber. Products are placed inside this chamber on a stand and blasted with dust and sand particles of a standardized size to check they do not cause clogging and to measure levels of abrasion. “Clients choose us because we can do all their testing in one place – temperature, humidity, dust, salt, fog, altitude, acceleration, shock, highly accelerated lifecycle tests [HALT], high cycle fatigue [HCF], bounce and vibration,” says Brown. The Warwick laboratory’s eight vibration test cells each have a retractable roof to reduce noise and to enable test objects to be craned into position. Each cell houses a shaker able to deliver forces larger than 25kN. The laboratory’s two largest shakers are 160kN LDS V984s. The impressive machines weigh 18 tons, are water cooled, can move test objects of up to two tons in three axes on a table up to 2.1m wide (7ft) and can be swapped between horizontal and vertical configurations. They are connected to a 32-channel M+P VibRunner control and monitoring system. 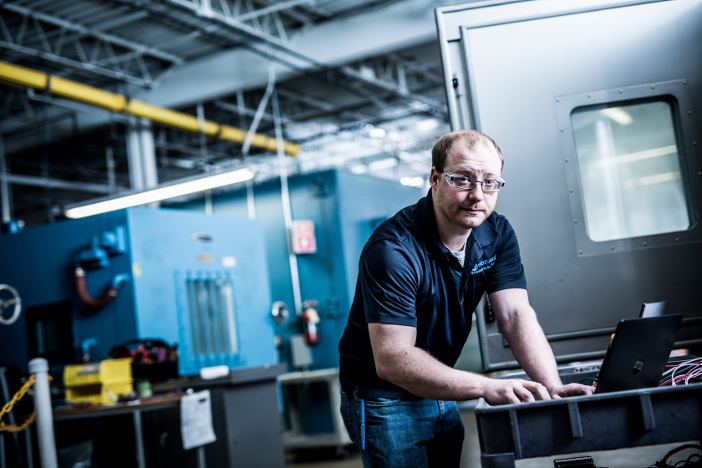 Vibration is the highest value testing conducted at the laboratory, so the process has been streamlined as much as possible to provide customers with their reports as fast as possible. Each cell has four analog lines and four Ethernet lines connected to a sleek control room with several controllers. This reduces complexity, noise and drop-outs. Software is standardized across all the machines and engineers use an automated documentation program to collate test results and output them into a single Microsoft Word file. “The documentation software has turned a part of the job that took up to three days into one that takes a few minutes,” says Brown. Away from the vibration test cells is a fabrication and storage area for the fixtures. A new fixture is made here every day in the workshop, which employs four technicians. On the opposite side of the laboratory to the test chambers are a number of smaller, self-contained test cells, where most HALT and HCF tests are conducted on many components and products, ranging from turbine blades from Rolls-Royce engines to cell phones. The equipment used in these test cells is smaller – air jets to create vibration and non-contact measurement tools such as laser vibrometers. Environmental testing is slow to change compared with, for example, EMC testing. Nevertheless a current major trend in environmental testing is the continual drive for improved fuel efficiency in commercial aviation. This is affecting aircraft engines and the areas around them in particular. As a consequence, testing in and around the engine is becoming more difficult, with engineers having to recreate higher temperatures, speeds and pressures. The Warwick laboratory will soon install a shaker capable of testing at high levels of up to 3kHz to help meet this need. Brown says, “The new system will give customers in Europe something they’ve never had access to before. “Engine manufacturers want to test at these levels – engines are running hotter and at higher pressures, which transfers to higher frequencies and greater g-levels. Another complex area the laboratory handles tests for is parts for helicopters and turboprop aircraft. The vibrations in lower frequency areas give lower blade passing frequencies, so ‘sine on random’, or ‘random on random’ with swept tone testing is necessary. “Those tests can be really complicated to program and to control, but we have the experience and expertise to do it,” says Brown. One of the most unusual and technically accomplished tests recently performed by Element’s Warwick laboratory was a scale model ditching test for Chinese aircraft manufacturer COMAC’s C919. The laboratory has performed controlled ditching tests, which are a requirement for certification, for two other aircraft, including the Mitsubishi Regional Jet (MRJ). “It’s the ultimate environmental test of the aircraft and its airframe in very difficult conditions,” says Mark Heaven, director of global aerospace product qualification testing. Element was contracted by COMAC in November 2016 to perform the tests. Engineers from the Warwick laboratory first built an accurate 1:14 scale model of the C919 from the original CAD models. It was constructed from balsa wood and can be split into separate parts and configured with different scale strength attachments to the engines, flaps, and front and rear spars. The model is designed and built so that it behaves in exactly the same way as the full-scale aircraft. “It’s remarkably difficult to build. You have to get the drawings and the model right and the placement of the instruments right,” says Heaven. Once the model was made, a 3D laser scan was performed and compared with the full-sized aircraft, to ensure conformity within a very tight tolerance. The model was loaded with sensors and instrumentation, including accelerometers positioned at the front, middle and back and a 360° gyroscope in its center. It was then taken to the Hydrodynamic Research Agency in Wallingford, Oxfordshire. Here Element’s engineers repeatedly catapulted the model into a large wave tank at different velocities, weights, moments of inertia and approach conditions such as pit, roll and yaw. A total of 120 runs – 90 in calm water and 30 in scaled waves – were conducted. During the tests, the model was landed on different parts of the wave in a number of different altitudes. Tests with head seas were performed last because they are the most damaging to the model. Measurements recorded during the ditch tests included the pressure across the model, particularly the bottom. The results give COMAC information about the flight parameters, such as which angle of entry gives the best chance of survivability when the aircraft lands into water. The information is used in the pilot’s manual. General manager of the Warwick laboratory Stuart Brown says, “The moment of inertia is important to get right and one of the hardest aspects. We have to ensure we have stable flight, so we built a small spoiler into the model to trim the approach conditions as we do not have a scaled pilot. This article was originally published in the December 2018 issue of Aerospace Testing International. To read the article in its original format and others like it, go here. To subscribe go here.